Gotham: The Complete Third Season hits Blu-ray this week and is now available in stores and retail outlets. 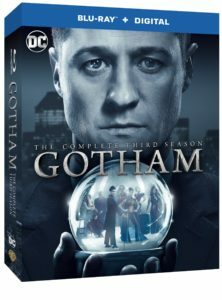 The 4-disc set contains all 22 episodes of Gotham Season 3. With 5.4 million viewers tuning in per episode, Gotham: The Complete Third Season features an all-star cast lead by Ben McKenzie (Southland, The O.C. ), Donal Logue (Sons of Anarchy, Vikings), David Mazouz (Touch), Morena Baccarin (Homeland, V), Sean Pertwee (Elementary), Robin Lord Taylor (The Walking Dead), Erin Richards (Being Human, The Quite Ones), Camren Bicondova, Cory Michael Smith (Carol), Jessica Lucas (Cloverfield), Chris Chalk (Rent), Drew Powell (The Mentalist), Maggie Geha (All My Children), Benedict Samuel (The Walking Dead) and Michael Chiklis (The Shield). Based on the characters from DC and produced by Warner Bros. Television, Gotham was developed by Bruno Heller (The Mentalist, Rome), who executive produces with Danny Cannon (Nikita, CSI), John Stephens (Gilmore Girls, Gossip Girl) and Ken Woodruff (The Mentalist, Shark). So how is the set? Here’s our review! The Episodes: Confession time: As big of a comic book fan and as big of a DC Comics fan I am, I did not get to see much of Gotham Season 3 as it aired on TV. A big part of that is that it airs opposite Supergirl on The CW, and it’s very difficult to keep up with so much at once, on the same night… or that’s my excuse, at least. The other possibly subconscious reason I hadn’t been watching is because Gotham is in many ways a much better show to binge, especially when you have the video and sound quality of a Blu-ray. So, when reviewing this set, I saw episodes that were new to me… and I was very impressed. This isn’t the same show that gave us forgettable stories like “The Balloonman” back in Season 1. I knew Gotham was quality; the Season 2 Blu-ray set really had me interested, but here… whichever episode I tune in for… I really like it. I like that there are some supernatural elements now. I like that we get to meet the parents of some people. I question the notion that everyone Jim Gordon romances turns out crazy. I love the delicious performances of Robin Lord Taylor and Cory Michael Smith as Penguin and Riddler, respectively. I enjoy Gotham’s take on Ra’s al Ghul, though it’s a bit odd to see a new Ra’s over here when his kids are simultaneously appearing on Arrow. The Court of Owls story was interesting, tying in to a story from the most recent years of the comics. And David Mazouz as young Bruce Wayne has done an excellent job, and Camren Bicondova as young Selina is given some great material this season which she pulls off purrfectly. It’s a huge cast, with so many characters to keep up with, but it’s an immersive world. And, again, the Blu-ray looks beautiful. So, if you haven’t been watching Gotham, even if you’ve missed what’s come before, it might be worth checking out Season 3 for an idea of the kind of show it has become. The Extras: Gotham Blu-ray and DVD sets often go all out, also expanding and showing off that world. Image & Sound: Again, can’t go wrong with this. They did a great job. A big highlight for me was actually the 2016 Comic-Con panel, partly because it was moderated by my friend and fellow Archie Digest podcast host Chris Hayner. A featurette called “Madness Rising” spotlights the villains that we see in Season 3, including the Mad Hatter, serving as a great “sell” to fans on the fence wondering whether to watch. “The Dark Within The Dark: The Court of Owls” examines that part of the story. There’s a very short feature on Ben McKenzie’s directorial debut, and there are deleted scenes for nearly half of the episodes. Is It Worth It? Absolutely, yes. I feel bad that I’ve neglected the KSiteTV Gotham portal Gothamsite in recent months, because seeing these episodes right now really energized me as a viewer. The show is moving to Thursdays this Fall starting September 21 on FOX; as there’s no longer a conflict with Supergirl, I guess I have no excuse not to watch, right? You can order your Blu-ray copy of Gotham: The Complete Third Season, get a discount, and support KSiteTV in the process! Check it out on Amazon.com.